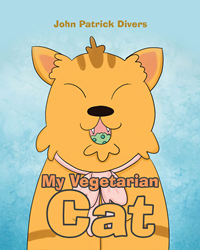 Recent release “My Vegetarian Cat” from Page Publishing author John Patrick Divers is a beautifully illustrated work that teaches children to take care of animals and eat their vegetables. John Patrick Divers, an experienced author, shipyard worker, and cat lover, has completed his new book “My Vegetarian Cat”: an amusing tale about Lacy the kitten who confuses her owner about her eating habits. Her owner tries and tries but Lacy is just as confused, but she is a hungry kitty. Eventually everything works out if only by mistake, but patience and love always prevails. Published by New York City-based Page Publishing, John Patrick Divers’s poetically written work is full of heart and teaches children how to adjust their perspective on the world. To spend a moment with a child is priceless and reading to a little one at bedtime is precious. The memories created are those that cannot be substituted. “The Vegetarian Cat” is an innocent being longing for attention, no different than the child listening to the story being read to them. Readers who wish to experience this amusing work can purchase “My Vegetarian Cat” at bookstores everywhere, or online at the Apple iTunes store, Amazon, Google Play or Barnes and Noble.